Learn about the Systane eye drops product range and which Systane product is best for contact lens wearers. Looking for an effective remedy for dry eyes? Millions of people all over the world suffer from itchy burning eyes from time to time. For some chronic dry eye sufferers, it can be unbearable and the condition is exasperated by environmental factors like dry windy weather, air conditioned offices, radiators and even saunas! Systane eye drops are special as the liquid turns into a thin gel when it comes into contact with your eye. This gel provides long-lasting relief for anyone with dry itchy eyes and it is recommended by opthamologists for both contact lens wearers and people who have perfect vision. Systane dry eye drops offer immediate relief and long-lasting comfort from eye irritations caused by wind, dry heat, bright lights or extended use of computers or too much television. There are a number of products in the Systane range including the most popular one featured in the adjacent image - Systane long lasting eye drops. Recommended by doctors in a survey of Ophthalmologists and Optometrists, Harris Interactive®, December 2008. With the exception of the Systane eye drops specially formulated for contact lens wearers - Systane Contacts - if you wear contact lenses and you also suffer from dry eye, you need to put the drops in BEFORE you insert your lenses. Most people find that they then have enough lubrication in their eyes to wear their contact lenses all day long. If you wear contacts and you also suffer from allergies which makes eyes itch like crazy, for example hay fever in springtime, then you need allergy eye drops and Systane products provide effective relief. Systane Ultra Systane offers even more lubrication as each drop covers the eye with a cushioning gel. The product is available in drop form either in a 10ml bottle or as part of a home and away pack with a standard 10ml bottle for the bathroom and a small 5ml bottle for carrying in your purse while travelling. You can also buy single use preservative-free Systane Ultra vials for ultra-sensitive eyes. Systane Contacts is therefore probably the best option in the range for easy use by contact lens wearers. NB: You can use all Systane products in your wear contact lenses, but you need to apply the drops BEFORE putting in your lenses. 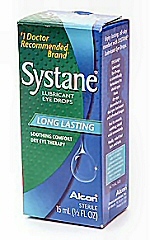 OR buy Systane Contacts, for relief from dry eye while you have your lenses in. Buy Systane eye drops in vial form here.